Is Grover Norquist losing his influence? 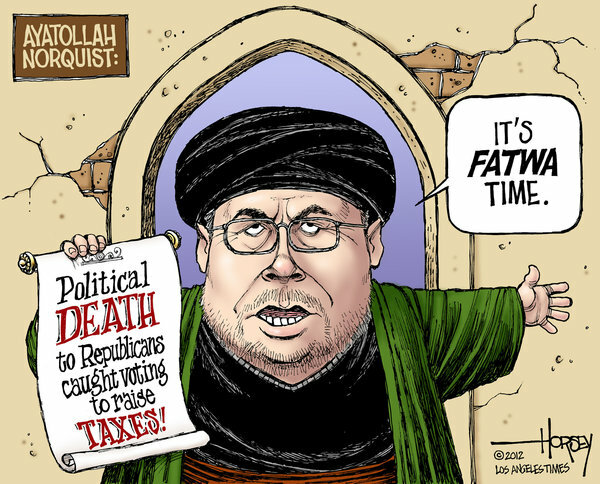 Grover Norquist from Americans for Tax Reform, and his Taxpayer Protection Pledge that most GOP politicians are compelled to swear their allegiance to over their oaths of office to the Constitution, may finally be losing sway. At least among the electorate, if not GOP politicians themselves. Among Republicans, it’s nearly as lopsided against the pledge. Twenty-six percent say they want a pledge supporter, while 69 percent prefer someone who doesn’t pledge not to raise taxes. That’s a pretty small universe of voters who insist on the pledge. And indeed, this isn’t the first poll to suggest quite limited support for Norquist’s pledge. A 2012 Quinnipiac poll asked whether people thought it would be good or bad “for a member of Congress to sign a pledge to an anti-tax group to never increase taxes on corporations or the wealthy under any circumstance?” Just 10 percent said it would be a good idea; 85 percent disagreed. That question, of course, only mentioned corporations and the wealthy, which could surely skew the results against the pledge. The question from the Post-ABC poll is much more neutral, but it still shows Americans — and Republicans — overwhelmingly oppose such a pledge. [O]ftentimes on an issue like this, the enthusiasm is on the more conservative (pro-pledge) side. But that’s not really the case here. Twenty-three percent of Republicans and Republican-leaning independents in the Post-ABC poll oppose the no-tax pledge and say it’s “extremely” or “very” important to them — slightly more than the 18 percent who support it and say the same. The picture is more pro-pledge among the most conservative Republicans, though. Thirty percent feel strongly about a candidate supporting the pledge; 14 percent feel strongly that the candidate shouldn’t sign the pledge. And these voters, we would note, tend to drive the conversation in GOP primaries. And this poll doesn’t mean Republicans will stop signing the pledge. There are other factors involved besides public support, including support from the business community and anti-tax advocates like Norquist, as well as campaign contributions from wealthy (and potentially tax-rate-conscious) donors. Certainly, signing the pledge has become a rite of passage for most Republicans — to Norquist’s credit. More like to his great discredit. This “no taxes — ever!” philosophy has caused substantial harm to the economic well being of this country. Next articleAre Rich Democrats the Problem?